It is about 15 ft up. Wanted higher but that was high enough for this old man with poor balance. It had a guard on the outside and a hallway on the inside. It faces SSE. And it has a wrap around porch. Sorry my pics are on their side. They were good in my pics. ???? I'd buy it! It looks awesome and is facing a good direction. If you ever go into business building these for sale let me know....Welcome to TSB! Looks great! Nest boxes are in great demand during the winter months. One suggestion I would offer is to cut out some hardware cloth and place at strategic locations on the nest box. I usually cover the roof and predator guards and will place a bit on the sides too with hardware cloth (I use heavy duty staples to attach them). 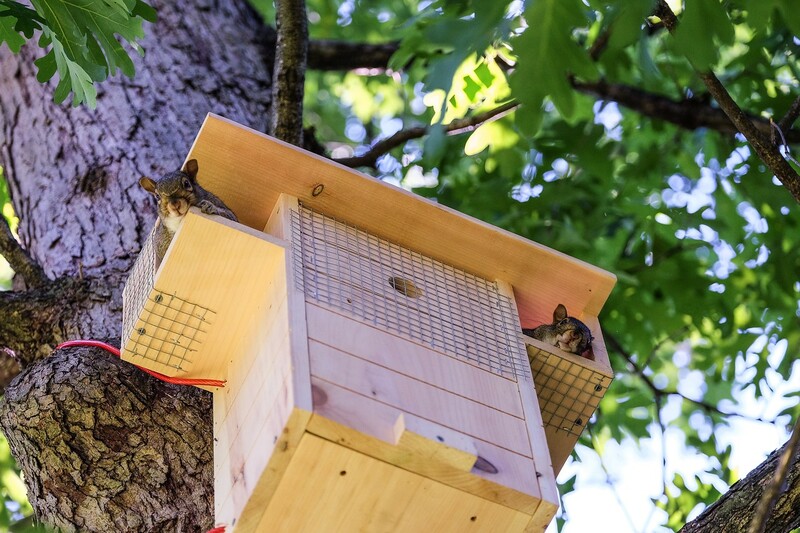 This does a couple things 1) it makes the squirrels less likely to chew through and damage the box 2) makes it harder for predators like raccoons to chew their way in and 3) provide a good grip surface for squirrels. Also, it is nice to have a panel that can be opened so the box can be cleaned out 1-2x a year! I use screws to keep the panel securely closed. You also might want to drill a few ventilation/drain holes in the bottom floor so water can drain out and to provide a little airflow. This is a professional built box that I ordered (my woodworking skills are lousy) and I added the hardware cloth. I do have drain holes in the bottom and ventilation holes in the side. Didn’t really know how big of holes to drill though. You did good ... I'd buy a couple. Welcome Chief !! I love it! Great job and it really shows you care. You're a good friend to the squirrels! Update: Sorry I’m not on here much but I hang out on the Firewoodhoarders forum mostly. Anyway, I just wanted to post my excitement!! I had not seen hardly any activity at my nest box this spring. I was afraid my winter par had left. To my surprise and joy, 4 young ones appeared on the box wrap around porch the first sunny day we had for weeks. They were half grown and out exploring the box. Now weeks later they come out and crawl all over the tree. I don’t see momma and I’m afraid they will be leaving soon. But it sure is rewarding to know I helped raise babies the first year! I would love to show you all pics but they are too skittish and fast. I just can’t seem to get pics. Anyway, I’m a happy daddy. but I know how difficult it could be. Got a few pics from the bedroom window. They are not to good but I couldn’t seem to get any outside. No way to get all of them together. They are to fast. They are growing fast. They just started leaving the box and exploring farther each day. I think they will be gone soon. Sorry my pics are right but turn on their side when I post them. They look great, thanks for sharing!! Those are some healthy, beautiful squirrelly kids! And to think, mamma picked YOUR box to raise her quints in and now they are almost ready to begin their squirrelly lives in the trees. Well done, Chief! Oh they look fantastic. Look at those tails. so new to them and so exciting. Nice job. Ok, year later. I’m sorry I go so long without a post but I’m on so many forums I forget. Well, anyway, my squirrel box was empty this summer. I think it got infested with fleas. But now I have a momma in it it and I think she has babies! I seldom see her because I think she is busy. But she knows when I make noise shutting the wood shed door to come check for food. I’m now feeding her high protein cubes along with her favorite, peanuts. Can’t wait to see her little ones. Well, I have 4 babies!!! No pics yet. They are way to fast. They aren’t going far from the nest box yet. They are really big. Can’t believe I haven’t seen them earlier. No wonder momma was so hungry lately. I love when they first start exploring.